The World Clock app helps you get the most accurate and reliable local time and time zone information for thousands of cities around the world. Find the current time and time zone information for multiple cities. Set an alarm in your local time for an event in another time zone. Organize all your most viewed cities in one single, easy-to-navigate page with a simple widget. • Accurate local time for a large selection of cities around the world. 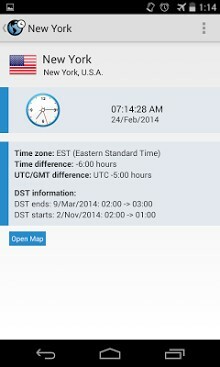 • Reliable time zone and Daylight Saving Time (DST) related information. 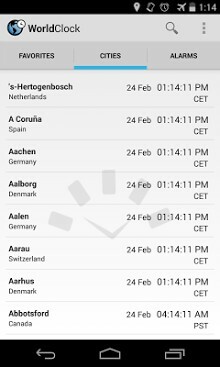 • Arrange Favorites to easily find the local time for your most viewed locations. • Add to your home screen a widget with the city you prefer, to track it’s time. • Set alarm in your local time for an event in another city. • Variety of analog clock designs and types of display – analog and digital clock. • Easy to customize. Add many cities/locations to Favorites, which are saved. • Choose between 24 Hour Clock or 12 Hour Clock format. • Easily supports landscape and portrait orientation. timeanddate.com is an established company that first came online in 1998. We maintain more than a decade of experience in being an accurate and reliable provider of time and date related information worldwide.